The Aloha Station is about 100 miles north of Oahu, Hawaii and was selected because of its closeness to port but distance from land influences (temperature, precipitation etc). The goal is to select a site that represents the north Pacific, where data can be collected on the interactions between the ocean and the atmosphere. Woods Hole Oceanographic Institution Hawaii Ocean Time Series (WHOTS) has used this site for research since 2004. You can find real time surface and meteorological data and archived data at the WHOTS website. We are stationed in the vicinity of mooring 12 and 13 in the Aloha Station to begin intercomparison testing. CTD (conductivity/temperature/depth) casts are conducted on a regular schedule. This data will help align the data from mooring 12 to mooring 13. If CTDs don’t match up between the two moorings then efforts will be made to determine why. Mooring 13 is being inspected to make sure sensors are working. Photographs have been taken to determine measurement height of the instruments and where the water line is. When I was aboard the Oscar Dyson, there were multiple studies going on besides the Walleye Pollock survey. The same is true on the Hi’ialakai. The focus is on the mooring deployment and recovery but there are a professor and graduate student from North Carolina State University who are investigating aerosol fluxes. Professor Nicholas Meskhidze earned his first Physics degree from Tbilisi State University (Georgia). He completed his PhD at Georgia Institute of Technology (USA). He is now an Associate Professor at NC State University Department of Marine Earth and Atmospheric Sciences. Meskhidze’s study on this cruise is looking at sea spray aerosol abundance in marine boundary layer and quantifying their flux values. Sea spray is formed from breaking waves. Sea spray analysis begins by collecting the aerosol. Using electrical current, particles of a given size (for example 100 nanometer (nm)) are selected for. This size represents the typical size of environmental climatically important particles (70-124 nm). The next step is to remove all other particles typically found in the marine boundary layer, such as ammonium sulfate, black carbon, mineral dust and any organics. The remaining particles are sea salt. 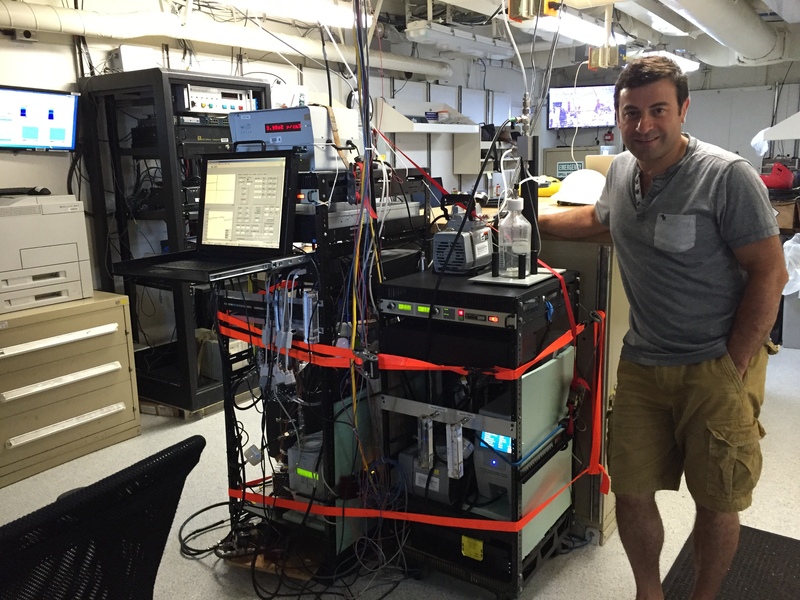 Meskhidze is looking at the fluxes of the salt aerosols. Sea salt aerosols are interesting. If a salt aerosol is placed in 80% humidity, it doubles in size. But then placed in 90% humidity, it quadruples in size. Due to their unique properties, sea salt aerosols can have considerable effect on atmospheric turbidity and cloud properties. Aerosols are key components of our climate but little is known about them. 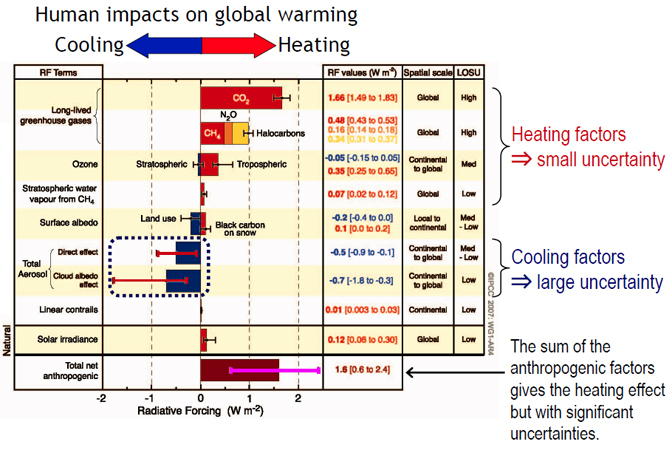 Climate models are used to predict future climatic change, but how can one do this without understanding a key component (aerosols)? The galley (ship’s kitchen) is a happening place three times a day. The stewards are responsible for feeding 30-40 people. Chief Steward Gary Allen is permanently assigned to the Hi’ialakai. He has worked for NOAA for 42 years and he has stories to tell. He grew up in Tallahassee, Florida and his early work was at his father’s BBQ stand. He attended Southern University on a football scholarship and majored in food nutrition. After an injury, he finished school at Florida A & M. He worked for a few years in the hotel food industry, working his way up to executive chef. Eventually he was offered the sous chef job at Brennan’s in New Orleans. He turned it down to go to sea. In 1971, he sailed for the first time with NOAA. 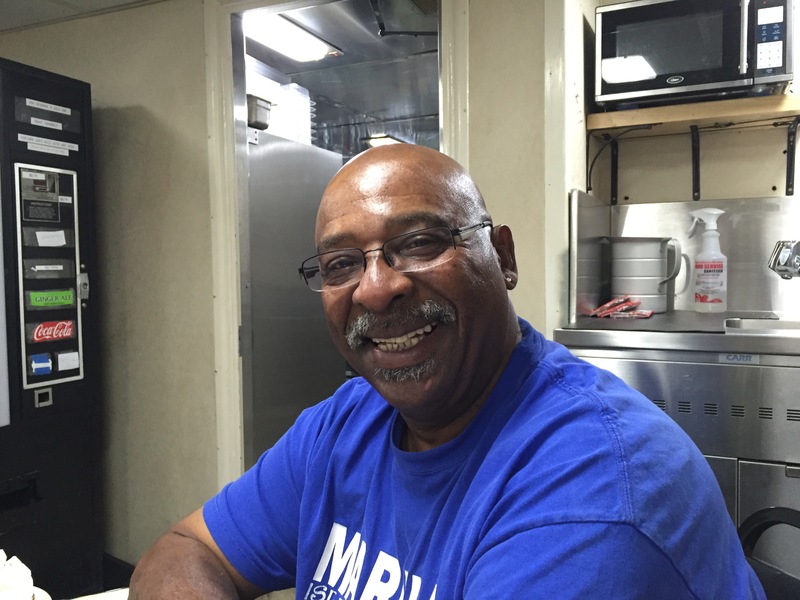 The chief steward was a very good mentor and Gary decided to make cooking at sea his career. He took a little hiatus but was back with NOAA in 1975, where he would spend 18 years aboard the Discoverer and would become chief steward in 1984. He would sail on several other ships before finding his way to the Hi’ialakai in 2004. In the 42 years at sea, Gary has seen many changes. Early in his career, he would only be able to call home from ports perhaps every 30 days. Now communication allows us to stay in contact more. He is married to his wife of 43 years and they raised 3 daughters in Seattle. I asked him what he enjoys the most about being at sea. He has loved seeing new places that others don’t get to see. He has been everywhere, the arctic to Antarctica. He enjoys the serenity of being at sea. He loves cooking for all the great people he meets. I met Ava Speights aboard the Oscar Dyson in 2013 when she was the chief steward and I was participating in the walleye pollock survey as a Teacher at Sea. She has been with NOAA for 10 years. She and a friend decided to become seamen. Ava began working in a shipyard painting ships. In 2007, she became a GVA (general vessel assistant) and was asked to sail to the Bahamas for 2 weeks as the cook. 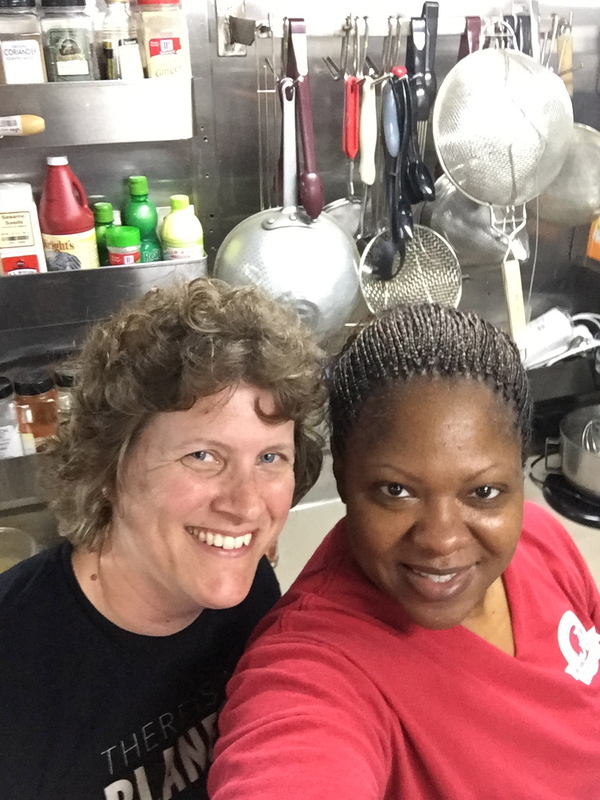 This shifted her career pathway and through NOAA cooking classes and on the job training, she has worked her way up to chief steward. She is not assigned to a specific ship. She augments, meaning she travels between ships as needed. She works 6 months of the year, which allows her to spend time with her 2 daughters, 1 son, 2 stepdaughters and 4 grandchildren. Her husband is an engineer with NOAA. Her niece is an AB (able bodied seaman) on deck. Her son is a chief cook for Seafarer’s. And her daughter who just graduated high school will be attending Seafarer’s International Union to become a baker. Sailing must run in her family. She loves to cook and understands that food comforts people. She likes providing that comfort. She has also enjoyed traveling the world from Africa to Belgium. 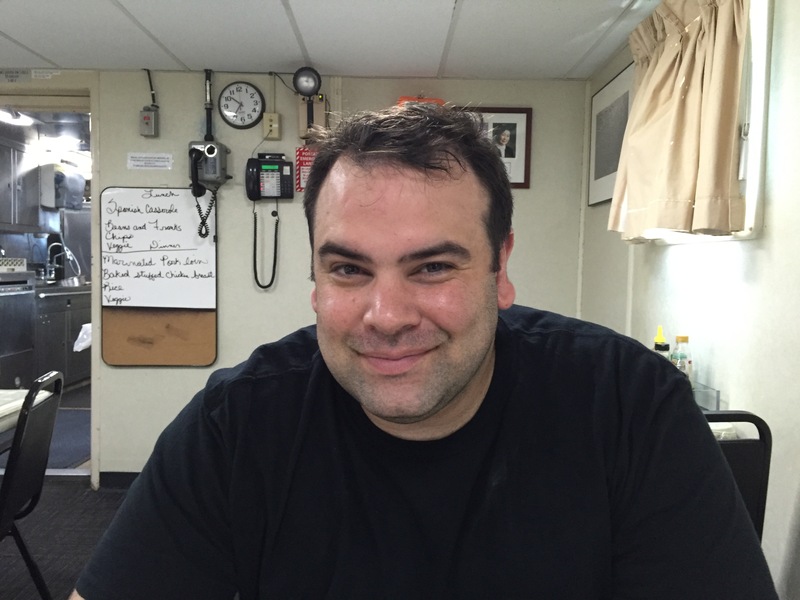 Nick is 2nd cook and this is his first cruise with NOAA. He attended cooking school in California and cooked for the Coast Guard for 6 years where he had on the job training. In 2014, he studied at the Culinary Institute of America and from there arrived on the Hi’ialakai. He also is an augmenter, so he travels from ship to ship as Ava does. The Hi’ialakai positioned mooring 13 in an area with a 6 mile radius known as the Aloha Station. Check out all of the research that takes place here at Station Aloha. There is a cabled observatory 4800 meters below the ocean surface. 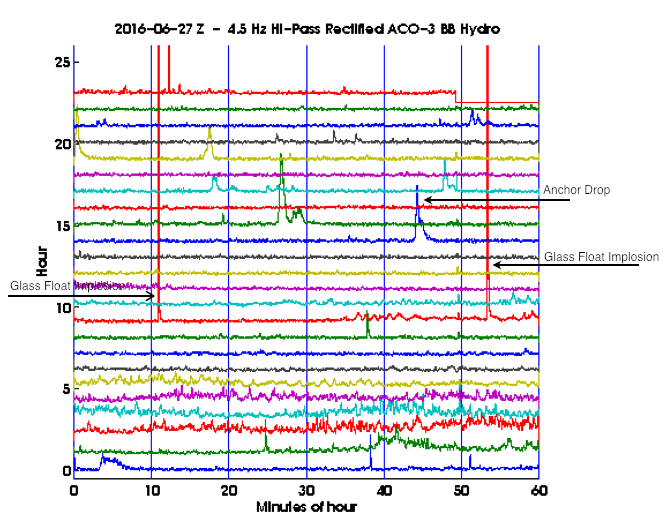 A hydrophone picks up on sounds and produces a seismograph. Check the results for the night the anchor was dropped. Click here to hear whales who pass through this area in February. 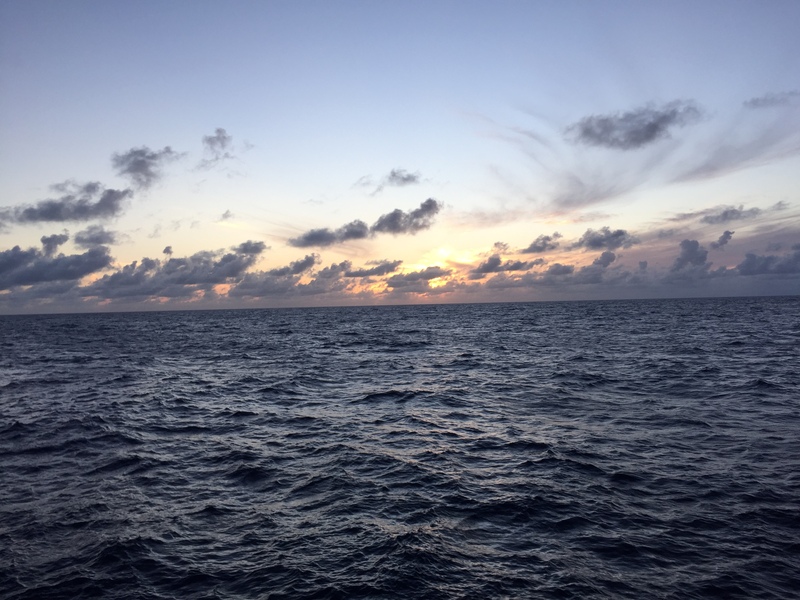 This entry was posted in 2016, Julia Harvey 2016, NOAA Teacher at Sea and tagged aerosol, climate change, Hawaii\, Hi'ialakai, hydrophone, Pacific Ocean, steward, Woods Hole Oceanographic Institute. Bookmark the permalink.